Deckel Maho’s new machining centre. THE new Deckel Maho DMC 60 T compact 5-axis universal machining centre from DMG Australia features high dynamics, fast palette changer, short chip-to-chip times, optimised work area design and a good price/performance ratio. 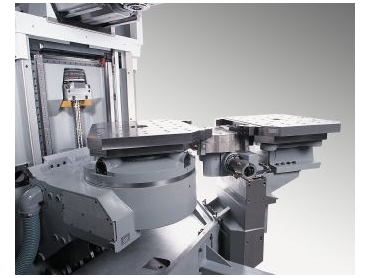 Deckel Maho presents this machining centre on the basis of the successful monoblock design with overhead traversing column which is also the basis of the many DMU 60/80/100 T machines installed in Australia. Important features are the fast palette changer for setup parallel to production time, as well as an innovative chain tool magazine, which can be expanded to 120 tools on request, and a fast CNC driven tool changer, which reduces chip-to-chip times to four seconds. * High performance 28kW spindle with 12,000rpm (optionally 18,000rpm). * B-axis that can be interpolated with a swivel range of 30° in each direction, beyond the horizontal or, respectively, vertical axes, which allows machining with negative angles. * Acceleration 0.6g, rapid feedrates 50m/min. * Internal coolant supply at 40 bar [580psi]. * Scrape belt conveyor above the gap sieve.